When we commit to our partner in sickness and in health, chances are we are paying very little attention to the in sickness part of the vow. Most likely we are envisioning a future with satisfying careers, a lovely home, and happy children. Nowhere in our story is there a placeholder for the intrusion of illness. Yet the CDC estimates that almost one out of every two adults will have a chronic disease in his or her lifetime. 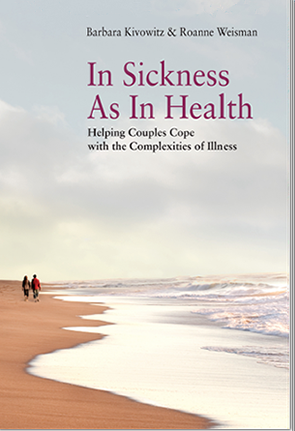 Among the people we interviewed for our book, IN SICKNESS AS IN HEALTH: Helping Couples Cope with the Complexities of Illness (Roundtree Press, 2013) were Frances and Ted, a couple who were in their thirties when illness changed their lives. Frances was a psychotherapist, and Ted was a scientist. When they weren’t working they were outdoors, tramping through the woods, climbing a mountain, or skiing down one. They were used to moving fast and being in control. Shared activities were a major part of their bond. 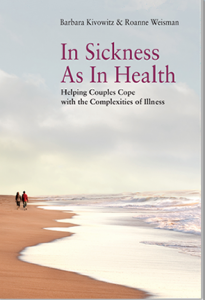 Illness became the third partner in their relationship, and its needs superseded the couple’s. Illness determined if they could travel, when they could socialize, and what activities they could do. Frances’ body had become a stranger to her; and Ted’s life had unraveled. Their old, active life was gone, and they didn’t know how to connect in this new one. For couples accustomed to the momentum of daily activities driving them along, illness is a giant stop sign. The routines around meals, laundry, work, and children get derailed as hospitals, clinics, and pharmacies become the new focal points. Their old ways of connecting aren’t enough. The ill partner is suffering, and the well partner is distraught, trying to mend what is beyond his control. The halt illness introduces can lead to estrangement, or it can lead to deepened communication and redefined values. As one of the experts we interviewed for our book said, “Illness can be the jolt that removes the dullness from our lives and unveils the potential.” When the mundane is stopped by illness, the couple can connect at a depth they might never have reached had it not been for the “jolt” of illness. One way for couples to reconnect is to practice an activity called “unconditional listening.” This is listening with mind and heart, without interruption, and without trying to solve a problem or come to a decision. By postponing problem solving and decision-making, the couple can be present for each other without expectations. This restores the closeness illness erodes and provides a stronger foundation for eventual problem solving. One partner at a time talks about what she has been thinking, feeling, and wanting, while the other partner listens deeply, with empathy, asking questions only to clarify. After the first partner finishes, the listening partner reflects back what he heard. Then it is his turn to speak while the other partner listens deeply. He doesn’t respond to what the first partner said; he speaks about his own thoughts, feelings, and needs. When both partners feel understood, they sit for a few moments in silence. The silence solidifies the experience and rekindles emotional intimacy. In fact, sitting in silence together can be a powerful intervention for couples, even without the unconditional listening activity. Frances felt heard, comforted, and reunited with her partner. This gave her the strength to keep searching. A few weeks later they found a rheumatologist who diagnosed Frances with fibromyalgia and put her on a course of treatment that helped. She still has relapses, but she and Ted are closer now than they had been pre-illness. They now choose to stop and pay attention to their connection. It is so important that people have support – no matter the issue. THis looks like a good resource for someone facing illness. I think I spend an unbelievable amount of time worrying about what I will look like as an older person. Is this a problem for me? 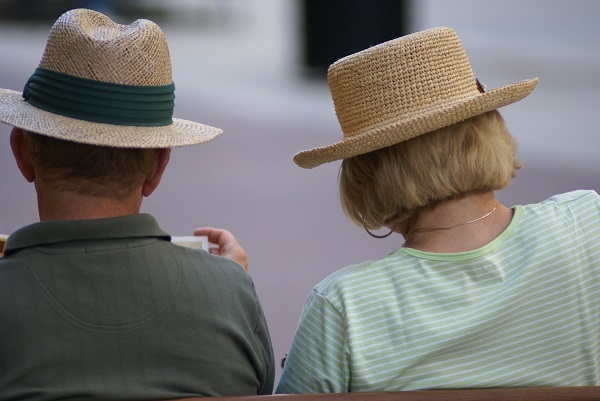 As someone who is in their early 60s, I can tell you … getting old is no fun. I have been going through healing candida and it has been a very long hard road. My Husband has been there with me every step of the way. He has even started eating more like I do to improve his own health. This is an excellent article! I love to read stories of couples weathering the storm of illness. It is more common for the healthy partner to leave it seems. Having dealt with numerous surgeries and chronic pain I know that it does take a toll on a marriage if the partner is not willing to acknowledge that things change. What a fantastic blog post. Very uplifting! Great article! That’s a wonderful story that could inspire many couples! Great article and a very interesting story. I know a couple that is going through something similar; the husband has been struggling for over a year with pain that is incapacitating, and has no set diagnosis as of yet. I’ve seen the wife struggle with being supportive; this is really a shared battle for them. I’ll mention this book to my friend. This is such a great article. My husband had a very painful surgery and lengthy recover last summer. Even though we are relatively young, it gave us new perspective of what it means to be a couple and stand by each other. This article would be good for my sister. Her husband is going through a tough illness and it takes a strong marriage sometimes to cope with that. I have an illness now and LOVE how my husband supports me. Great post! Thank you for sharing that. I like the technique of unconditional listening without solving the problem. Sometimes you want to be heard and understood. What a good article. My family is dealing with this personally right now as my father is battling a chronic disease. But my moms still there right by his side. I can see how easily though things can change. When I was very ill with Cancer my husband helped me recuperate. My husband is now deceased but during his battle with cancer our relationship became stronger and more precious each day. I now have the memories of our love together and how we fought as a unit.